I have been a high school teacher for most of my teaching career. And I have taught DP History and DP Theory of Knowledge* for over 8 years. I have been that teacher who is worried about external exams and covering the content. I have been a stress-creator for my grade 11s and 12s. Chalk-and-talk was a regular (though not constant) teaching method. Many, many assessments were the dreaded past-papers. I believe many of my students enjoyed my class and learned a lot despite me playing sage-on-the-stage. But as the years went on, I grew bored** and convinced there were other ways to teach and I started using more projects and multiple assessment styles for my DP classes. I studied alternate teaching methods. And then I became a middle school teacher, which in many ways fit my philosophy of education much better than being a DP teacher. 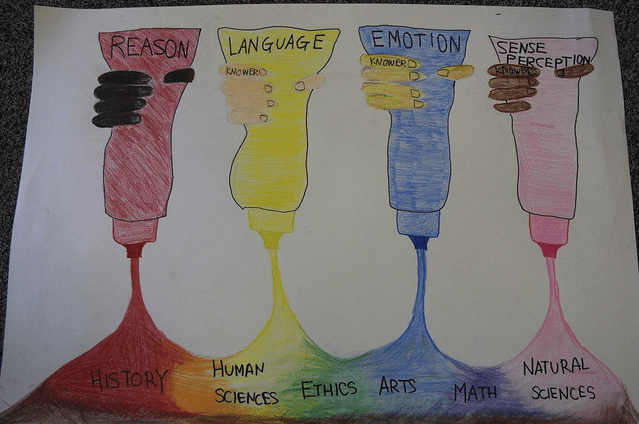 Modified TOK Diagram created by members of class of 2013…proof coloring doesn’t need to stop in high school. For most of COETAIL, I have been thinking about how to transform teaching and learning in a middle school humanities class. Honestly, this is an easy place to try Project Based Learning and introduce global collaboration opportunities. My challenge now is to take these these teaching methods that I think best serve students and use them in my DP Theory of Knowledge class. I see these grade 11 kids ninety minutes a week, plus an annoying 30 minutes before school every other week. We do have stuff we need to cover and teacher directed learning is almost always quicker. I just need to be smart. I find DP kids often like to be spoon-fed information, whenever possible. They are busy and they are stressed. They want the information quick and easy, even if it is boring. Doing PBL-style learning isn’t easy and kids surprisingly don’t embrace it the way we think they will. TOK isn’t always valued, by students or staff. One of my goals as TOK coordinator is for this to change at YIS. TOK is taught around the world. Every Diploma student takes TOK. That means there are a lot of schools, teachers, and students we can work with. Let me know if you want to work together. I think this is something sadly missing from my TOK classes and I don’t think I’m the only one. The curriculum of TOK is a lot less content driven than all other DP classes. It is based around the concept of “how do we know what we know”. Concept based learning should be driven by student inquiry. In fact, one of the criterion is “Knower’s Perspective.” This is the right class for students to think freely, make connections, and develop their own voice. So let’s see how this goes. The general goal of for the next month is for students to develop a presentation using strong design skills. They will make connections, with other TOK students, YIS teachers, and YIS students. They will pick what they are interested in, look at the criteria for a presentation and then challenge themselves to figure how their learning in school can affect the world. They will struggle to understand the terminology of this new and wonderful course. I will act as a guide and a resource, but hopefully I don’t have to talk too much. I’ll stop asking leading questions and let them ask open-ended questions. . Because good teaching and learning shouldn’t stop at grade 11. * TOK is the center of the IB Diploma. It’s for students to practice critical thinking and make connections between their other classes and the real-world. I’ve taught this course in three schools on three different continents and I think high school students are so lucky to take this amazing course. **It’s dull repeating a lecture for the fourth time and read the exact same essay 80 times. And I find it a little depressing/boring that I’ve taught TOK the same way in all three schools. We did do an awesome Fed-Ex day in Munich with our TOK kids and something I’m eager to bring to YIS. This entry was posted in COETAIL @YIS, IBO-MYP-DP, Uncategorized and tagged coetail, DP, pbl, Theory of Knowledge, TOK. Bookmark the permalink. I am a teacher in an independent school who will be sending (after her applying) to an IB diploma program in Georgia when she enters high school (my daughter is now in 3rd grade). I get excited when I learn what the IB program has to offer, and when I read what teachers who teach in the program experience in the classroom, I get even more excited that my daughter will have the opportunity to get such a quality education in a public school, without me having to spend thousands of dollars. I know of the rigor of this program, and my husband and I are preparing her rigor as she grows up. Thank you for sharing this. Thanks so much for stopping by. After teaching IB for the past 8 years (including in a public school in Virginia), I truly think it’s an amazing program and opportunity for students. It’s challenging, but the rewards are great. Your daughter will be lucky to study in an IB school! Awesome! I really want us to do the FedEx day this year – let’s start planning that soon so we can make it happen! Let’s get the FedEx day going! This is the year to make it happen. I first want to say thank you for posting such useful, inspiring stuff on this blog. I’m new to MYP/IB/TOK ( I wear many hats ) and work at a small international school in Hong Kong. There are no other History or Humanities teachers to learn from. I have thus found your reflections a HUGE help! If you are ever looking for a collaborative TOK (or MYP Humanities) partner in Hong Kong, my students (and me) would love it. Keep fighting the good fight!…. ps. my MYP 3 are “tweeting the Russian Revolution” this weekend, thanks!